It’s that time where we announce our second winner – The Most Interesting Developer for September. Meet Fabrizio Gianneschi who is also a Jelastic user! He stopped by our booth at JavaOne last month and we can definitely confirm he is INTERESTING and passionate about all things Java! Fabrizio Gianneschi is an engineer who works as a technical officer for the Autonomous Region of Sardinia (Italy) and, as a freelance IT consultant, for local companies and professionals. He is one of founders of the Sardinian Java User Group, that he led as chairman for years, as well as a known member of the international community of the JUGs leaders. Fabrizio is also a member of the Java Champions, an exclusive group of passionate Java technology and community leaders who are community-nominated and selected under a project sponsored by Oracle. An expert programmer, he has over 20 years of experience in software analysis, project and development. During his career he experienced many ITC fields: standalone and web applications, content management systems, databases, e-business, e-government and, recently, online tourism. 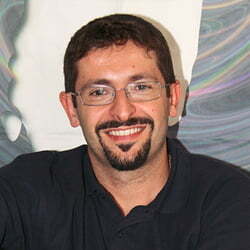 Fabrizio is also an active technical writer, teacher and author of various articles, publications and reviews. He’s an enthusiast evangelist of the open-source philosophy, practices and tools. I was born (ahem…) 2^5+8 years ago in Sardinia, an Italian island with world-class beaches and a really unique culture, where I still live. I can define myself an engineer with a geek heart, in the sense that I love technology but I’m not obsessed about it. You’ll never find me lined up to buy the latest phone! I enjoy to talk with other people, be part of communities / associations, and often I tried to mix the two things together. As an example, participating tech communities or by using technology to help other “normal” people solve real world problems. Yeah I really love to solve those problems; that’s what engineers are made for. Since the beginning, computer science and IT in general has been my bread and butter. I started playing with a Mattel Intellivision console, which was a huge success of the early 80s, but shortly after my parents also bought me the Keyboard Component… and then the real fun started. I was lucky to grow up in the 8bit golden era, so I enjoyed hacking the devices of those times (the Commodore’s, ZX Spectrum, early PCs…), doing assembler programming and lots of other funny things. It was like a digital Wild West, and we were the pioneers. After the university, I started to get more and more experienced with Java… and then it became my daily job. I quickly entered its worldwide community and I’m still having a lot of fun with it. When I’m not on a keyboard, my personal interests are all around my family, reading and travels. I have practiced many sports, but like most of the Italians, for me football is THE sport. As years go by, I’m not the striker that I was in the past, but I’m still able to kick some butts in the playing field. Well, honestly I don’t like to self celebrate myself very much. Generally, I let my actions speak; I really feel the necessity to be a good role model for my children and my colleagues, sharing knowledge and having fun with them, because I don’t like the people who respect only the best and look down on the others. Sometimes you succeed, sometimes not, that’s life. If I’d have to say only one reason, however, I’d say I may be interesting because I’ve always tried to do interesting things. In particular, an example of how many great things people can do, even if they live in very small places, if they’re fully committed and enthusiastic about what they do. I’ve helped our JUG reaching the highest levels, achieved personal success and helped a lot of people to learn Java or starting new communities never asking a cent for that. I’ve gained experience in the private sector both as an employee and as a freelance consultant. I’m also a part-time public employee, so I know also how things are going on there, and the differences between running a small website or a multi-million dollar public founded project, used by hundreds of thousands of people. I can go crazy with video games and still write boring corporate reports. Different faces of the same cube, a quite interesting one I think. In Italy, everyone that needs to place a sign or a banner in public roads or squares has to pay a tax to the local municipality. Think about shops signs, advertisements, and so on. It was the 1992 and my first (paid) project was software designed to collect all of that data and to handle them correctly. It was developed in assembler and Turbo Pascal 6.0, entirely in text mode; we developed everything from scratch, starting from the low level mouse libraries up to the object-oriented API that we created to develop higher routines and interfaces easily. It had also real-time help with hypertext. It was awesome for that time and I’m still astonished about how many lines of code we were able to write in so few months. Of course it’s not available in production anymore, but I still have the sources, somewhere. You founded JUG Sardegna. Can you tell us more about this? Some years ago, me and some friends realized that the pace of innovation in Java was simply too quick (for us, and probably for all the others, as well). Too many libraries, frameworks… and we were only in the 2002! After some thoughts, we concluded that the only way to remain on the top of the edge was to create a group, a community of Java enthusiasts where everyone could benefit from each other’s experiences. In few weeks we started the Java User Group Sardegna, which had an incredible success on our local community. We were not prepared to such a rapid growth, and the group quickly collapsed under hundreds of useless discussions like “What about this logo?” or “We need to use that Xyz CMS…” and so on. This was a hard but very useful lesson. We stayed quiet for almost a year and then we restarted the JUG, this time by enforcing a strong leadership and commitment. Briefly, we gained more and more success and we were accepted in the SUN Microsystem’s “top 50 JUGs” list; we started to become famous both at the national and the international level, especially in 2006 when we won a Duke’s Choice Award (the “Oscar” of the Java technology) for an open source project we developed for free for the local blood banks, in order to help them to reach the donors by using SMS and mobile telephones. In the following years we consolidated the success but, slowly, the momentum faded away and now the group is almost inactive. We’re still trying to restart it but it’s not easy. These are the times of the social networks, we’re getting older and it’s very difficult to find time and new people. However, it was one of my best achievements and it was worth each of the (hundreds) of hours I’ve put in it. I strongly recommend everyone to start or join a local community! Easy one: Java. Lots of people complain about the language, and prefer to talk about the beauty of the Java Platform as a whole or the Java Virtual Machine (JVM). But I still like it, I’ve always been a lover of the language itself. Because is the most powerful tool we’ve ever had to solve so many problems, while remaining under the same umbrella. It’s not a magic bullet, but it’s very close. There’s no sector of our life, I think, where Java doesn’t exists or could help in some way. Yes, there are some technologies that are probably better suited for some cases, but none of those can even reach the Java popularity or flexibility. The community is HUGE, the libraries are endless, the job opportunities are always a lot. Java had a bad momentum some year ago, but now with the new JavaSE 8 and JavaEE 7 it’s again on top of the edge. It simply rocks, it’s optimized for multicore and cloud architectures, and will stay here for a long time. Apart from the JUG Sardegna, I’m part of the local Google Technology User Group, even if I’m not a very active user. Anyway, I like the way Google supports its groups. I’m also a member of the Java Champions, a selected group of Java experts, leaders and influential people who have a “special channel” with Oracle in order to discuss about Java and give them our independent feedback, often under Non Disclosure Agreements (NDA). In the past, I’ve contributed to some open source projects, as ours “JUG Sardegna 4 AVIS” and the more famous “iBatis” (now MyBatis). These days I don’t have so much spare time to code on other projects, and then I’m contributing by submitting translations or by donating money, which is as well a good way to contribute, I think! Since I’m a community guy, I give a lot of importance to the relationship skills and not only the technical ones. We’ve a lot of experts that can’t handle a group of people, or even a conversation with them. On the other side, tech skills are very important, for a developer. So my answer is Bruno Souza, “The Brazilian JavaMan”, “the guy with the flag”… and so on with his nicknames. I consider him a reference on how a very skilled developer can be also an incredibly successful, tireless, credible, energizing but also funny leader. He was the president of the SouJava, one of the largest JUGs in the world, as involved in lots of expert groups and worldwide communities. He’s a man with incredible resources, I still can’t get how he can handle all those things; so I can’t think anyone but him for this title. We agree. Bruno is an inspirational guy! I’m using Jelastic both on corporate and private projects, in production and internal applications. What I really like about it is its simplicity; once I wrote “it seems too good to be true, but it’s true!” and it still appears to me. You did a great thing by abstracting the system and providing developers with a simple platform that is really easy to use, especially for deploying and scaling Java web applications in the cloud. Also, the tutorials are very rich and useful; lots of applications and techniques explained. Lastly, the SSH access feature you released some months ago was really the missing one: Now we have the weapon to handle those very special cases that can’t get solved by using the web console only. These days, everyone’s spending much more money on DevOps than on the hosting itself; so instead of choosing a $5 do-all-for-your-own server, I prefer to have a platform that automates most of the human work and is less error-prone. I can’t give you more details, but I’m working with one of my biggest clients Sardegne.com to migrate part of their infrastructure under Jelastic. Infinite knowledge or infinite power? Infinite knowledge without power brings depression. It’s way better to have infinite power, and have fun, even if you don’t know why! …it would be called Oak! Do you know The Most Interesting Developer in the World? – Nominate them here! Follow Fabrizio on Twitter.